Step 1: Metal atoms move from the hot electric arc toward the cooler arc tube wall where the halides are. 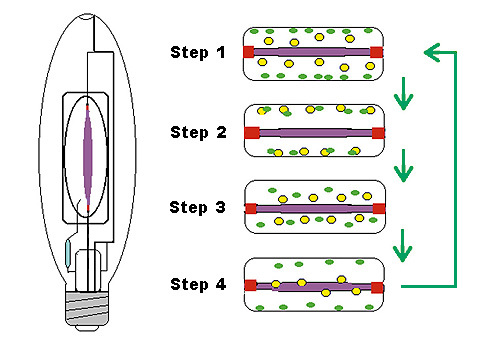 Step 2: Near the wall, the temperature and vapor pressure allow the metals and halides to form a stable molecule which will not corrode the arc tube. Step 3: When the metal halides approach the hot arc, the molecule breaks apart. Step 4: The halides move away from the arc, while the metals are energized and radiate light. Sometimes a metal atom will not combine with a halide, but instead migrates through the arc tube. Over time, when enough metal atoms are lost, the lamp will fail.